MotoOnline.com.au tests the 2019 Suzuki RM-Z250. 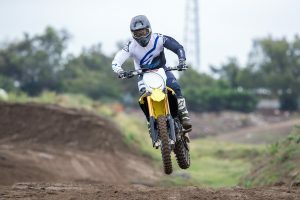 After releasing the all-new RM-Z450 for this year, Suzuki has followed suit ahead of 2019 with the latest RM-Z250. 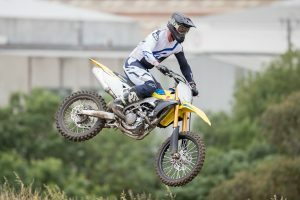 The updated model is essentially all-new and features a significant amount of updates and changes to the chassis, engine and suspension package in a bid to make an added impact in the quarter-litre category. The renowned Japanese manufacturer has given its new 250F a complete overhaul inside and out, which we had the opportunity to sample during this month’s national press launch in Victoria. 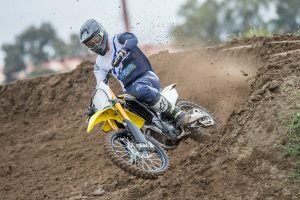 Park4MX was the track of choice for the 2019 Suzuki RM-Z250 introduction and, as I was driving down, I thought we were in for a long, wet and muddy day, but as it turns out, the clouds parted and the track was in tip-top shape. We started out with a quick presentation on the RM-Z250 and all the new updates it features, then shortly after headed back to gear up and get out on the track for some test riding. 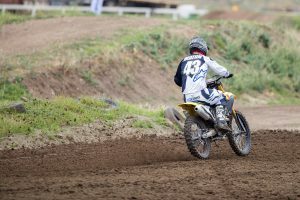 The track had the perfect amount of moisture everywhere thanks to the rain, so the corners formed up quite quickly and the hard-pack sections out the back were as tacky as ever, which gave you the opportunity to push the bike quite hard with traction being maximised. As referenced above, the 2019 Suzuki RM-Z250 has had a complete overhaul. 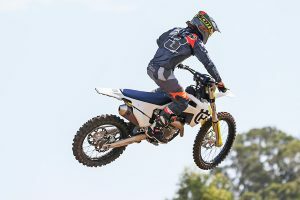 Starting with the engine, it features a long list of updates including reshaped cylinder-head ports now with a more direct downdraft layout, a larger air-filter aperture, higher fuel-pump pressure, a new cam profile, an updated traction management system and also a new exhaust system including a longer, thicker header-pipe that improves power output throughout the RPM range. 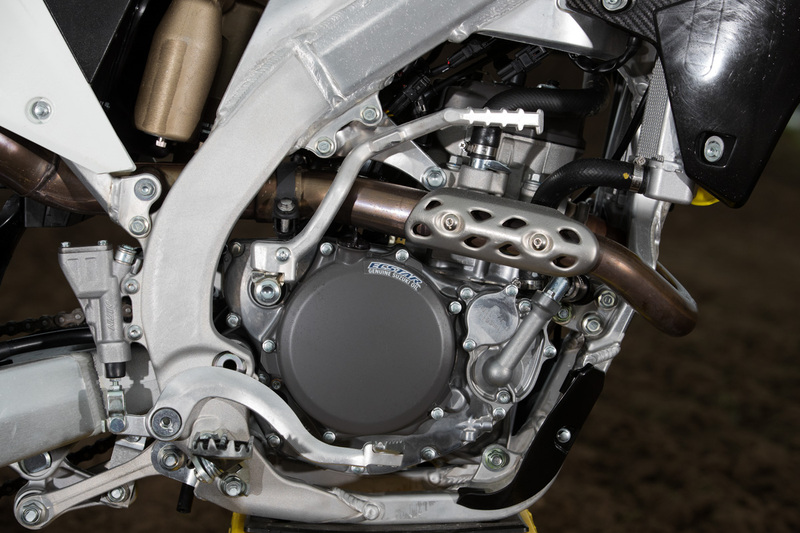 A completely new addition to the RM-Z250 motor is the twin injection Mikuni throttle body. Suzuki has made the move to bring this out as a standard feature, which is aimed to increase power at high revs. 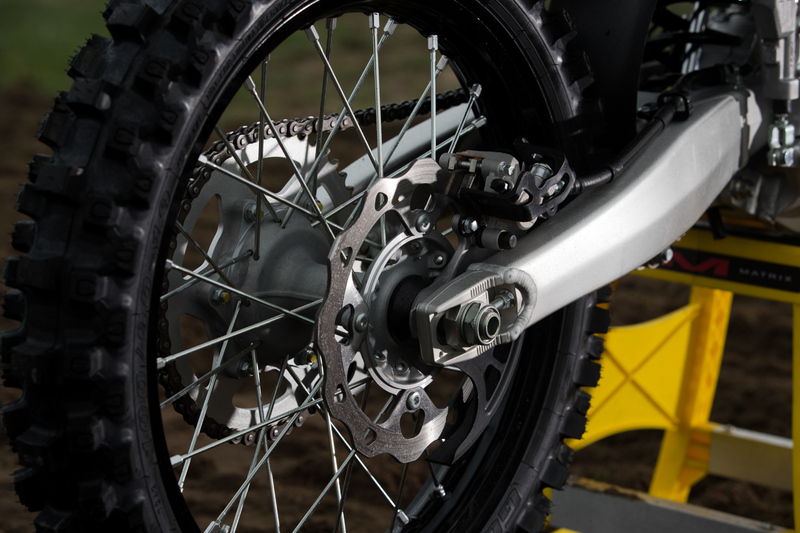 The second gear ratio has been widened, while an extra tooth on the rear sprocket has been added to 50 in total. 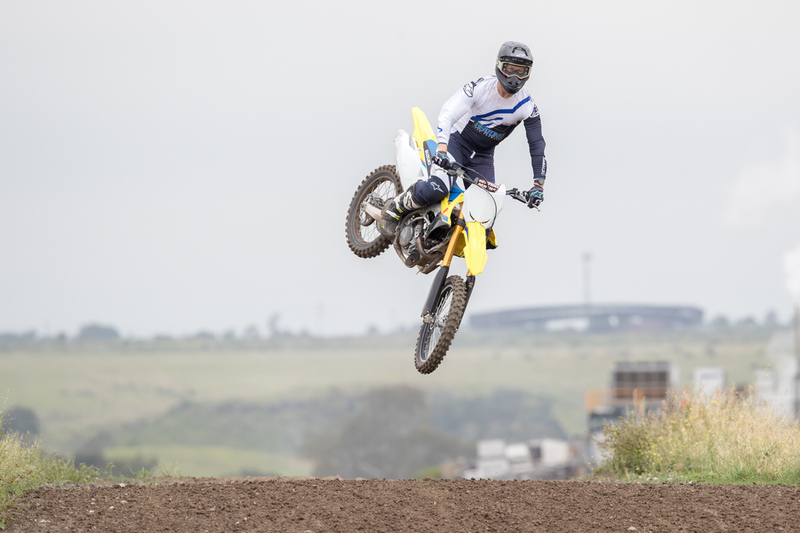 Suzuki has also updated the high-tech S-HAC (Suzuki Holeshot Assist Control) system and improved ignition timing for better throttle response, which collectively leads to a better launch out of the gate. It has multi-settings, too. Elsewhere, the front brake rotor has been upgraded from 250mm to 270mm and is paired with a new brake pad material, while one of the major changes for MY19 is the move to the 48mm KYB coil spring fork that’s gold anodised, as opposed to the Pneumatic Spring Fork (PSF2) that was fitted in recent years. It’s a great move, not only for the handling and predictability of the ride, but just for the ease of maintenance for your everyday rider. At the rear, a new linkage ratio developed in pro racing has been utilised, alongside a lightweight, thin rear spring inherited from MotoGP. Lighter Dirtstar wheels are of a significant benefit. A new tapered Renthal Fatbar handlebar bend (repositioned 7.4mm forward and 3.8mm downward) has been fitted with less sweep to get you at the front of the bike and allow for a more comfortable riding position. 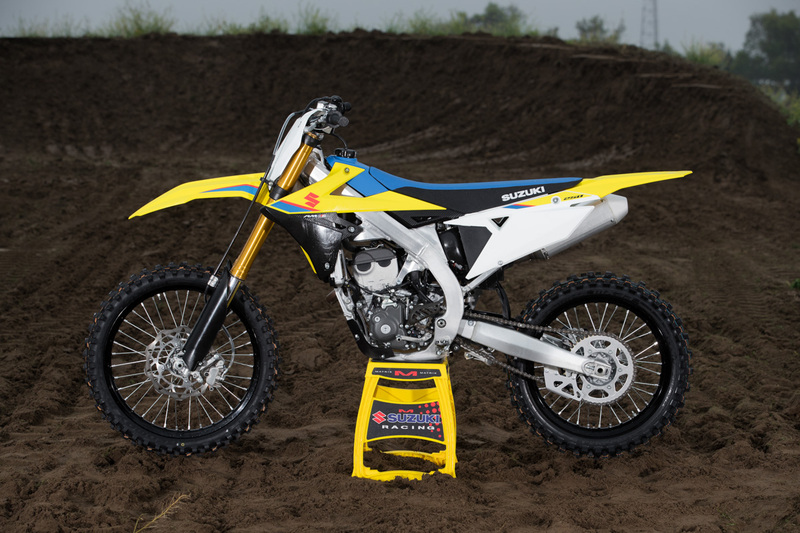 The frame is completely different to its predecessor model and changes the characteristics of the bike quite a lot. 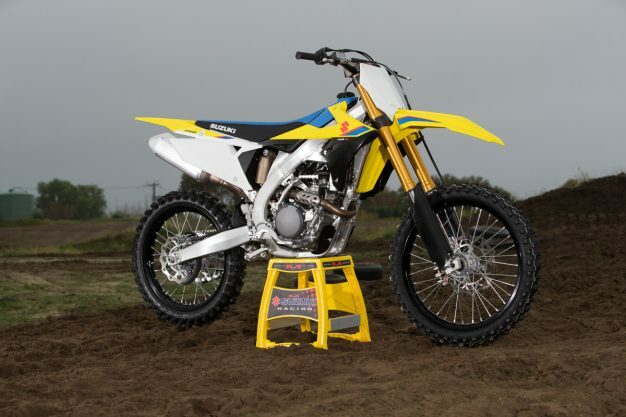 It adopts the same frame design as the 450 model, although just with a slightly different swingarm designed to be not quite as rigid as the premier class model. The aluminium frame spars have changed to a hollow square section that does away with an internal rib, increasing torsional rigidity by 10 percent. 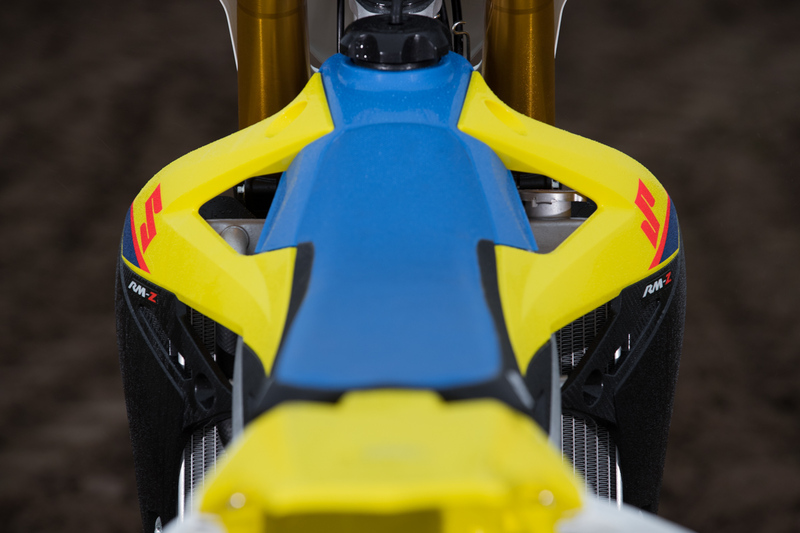 Using a new hydroforming process for the aluminium swingarm permits a tapered cross-section without any welding, making the new assembly just as rigid with thinner walls. In order to increase the RM-Z250’s agility, the engine position was pivoted upward at the rear engine mount by 8.5mm measured at the crankshaft centre. 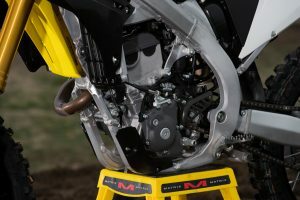 The upper engine mount brackets are now aluminium instead of steel, and rather than four brackets suspending the engine from a single location, the 2019 RM-Z250 has four brackets on both sides of the engine. 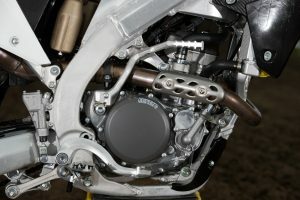 The seat rails (now hexagonal to allow easier air-filter access) have been moved closer together for a narrower mid-section, while also being raised to ensure adequate air-box capacity. 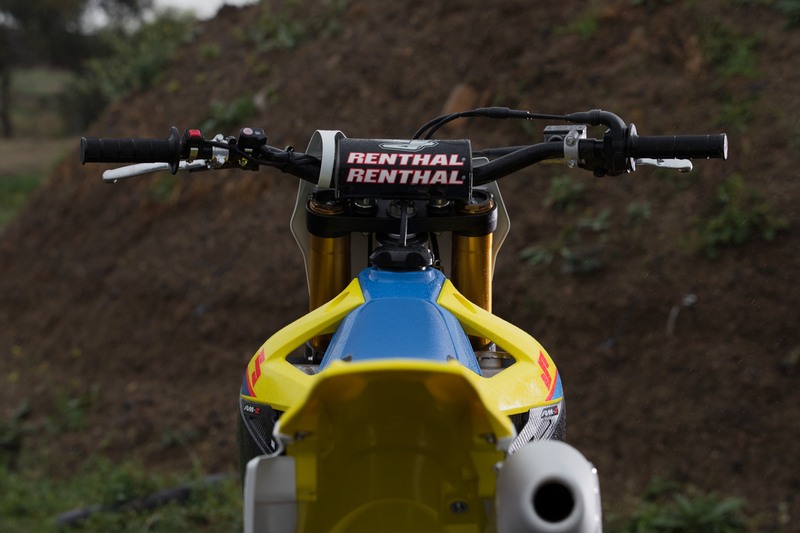 In order to take advantage of the new frame, the seat has a different shape and foam density. 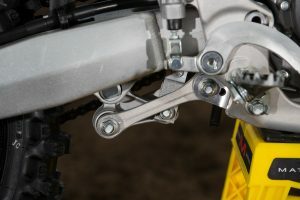 The footpegs have been moved 3.3mm forward and 5.2mm upward. 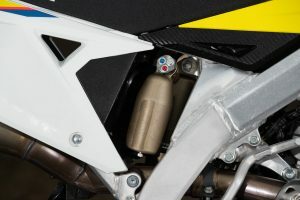 Plus, the aluminium fuel tank has been changed to a resin-based unit. All of this amounts in weight savings across various areas, however Suzuki hasn’t supplied a final weight to compare to last year’s edition. 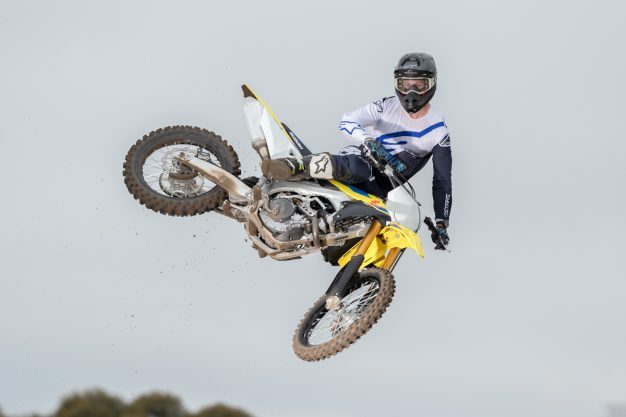 Suzuki has increased horsepower and torque across the board for the new year, boasting a five percent increase in top-end power, greater output and an improved throttle response. The aim from engineers was to make the engine more responsive at higher RPM, with greater torque at lower RPM, which makes for a completely different feel than year’s past. 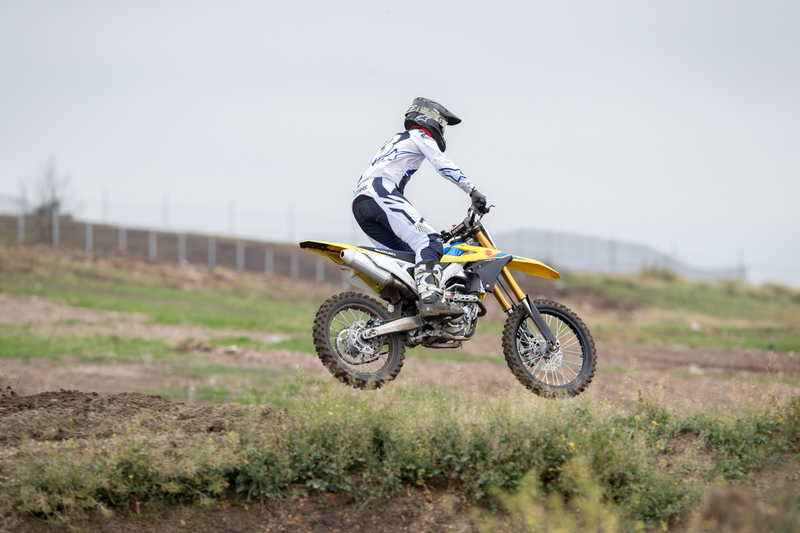 The motor on the 2019 RM-Z250 was interesting to experience for me, because I find that a lot of modern four-stroke 250s these days are all about being revved and Suzuki has adopted that same philosophy with its new model. 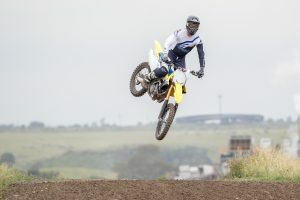 Initially I kept finding myself in between gears as it took a little bit to get my head around how much more this bike revs out compared to the older model, but once I had spent a few laps working it all out I noticed the higher in the RPM I stayed, the better it performs. I found if you let the power roll off down in the RPM too much in tighter turns or off of jumps, it takes a little bit to get going again due to its characteristics. The way the power is delivered, the bottom-end power in comparison to last year’s model doesn’t appear to be as strong, even though it has actually increased, but that’s primarily due to the added top-end power. To really extract the best that this package has to offer, it basically requires you to maintain a higher RPM to keep the momentum going, because of the way the power is delivered. The gear ratio has been updated so it’s wider in second gear for 2019, which I found to be really positive by allowing the gear to be more useable through the corners, while also allowing you that fraction more time on the exit of the turns to hook third. Overall, the RM-Z250 is definitely more powerful for 2019, but to make the most of it you have to use a more sweeping MX2-type of style to keep it in the optimal RPM range and maintain a flow. As a result of that, I think it’s a step in the right direction for competitive racing and Suzuki has taken the right direction when it comes to that area. 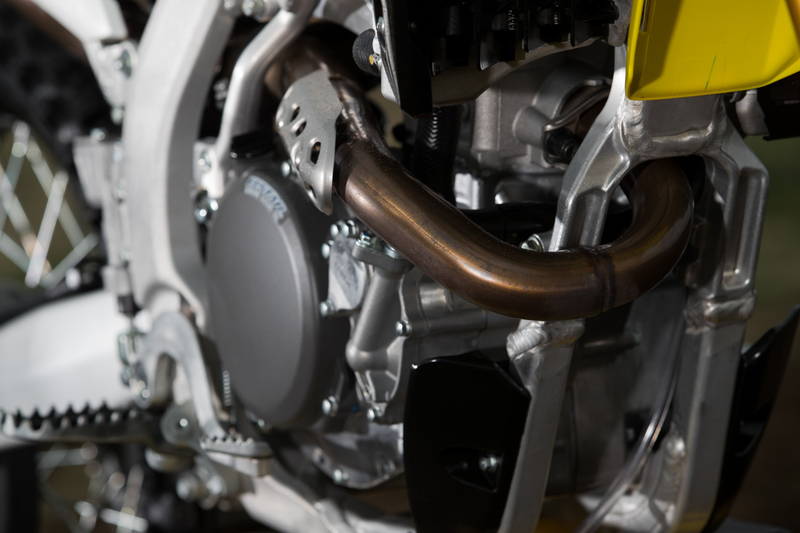 While not fitted or officially announced at this stage, Suzuki has revealed that a new Wi-Fi engine tuner will be introduced to further enhance customised tuning of the power delivery via a smartphone (stay tuned for more on that!). 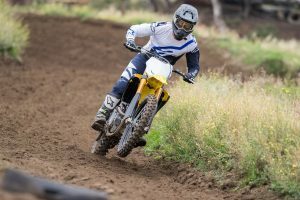 There’s a bunch new when it comes to the 2019 Suzuki RM-Z250 and the chassis is what I was most surprised about, because it has dramatically changed the way this bike handles. It’s still sharp, but not as familiar as the previous MX2 contenders from Suzuki had become. 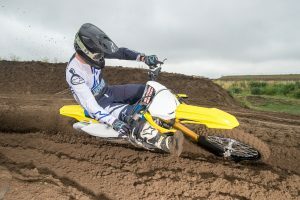 Having gone back to the KYB spring fork, it has a firmer feel than I expected at the front-end, a feeling that is magnified by the frame’s increased rigidity which offers a lot of feedback to the rider on-board. You will still benefit in comparison to the old PSF2, but usually stock bikes tend to provide a more forgiving sensation in terms of front suspension straight out of the box. 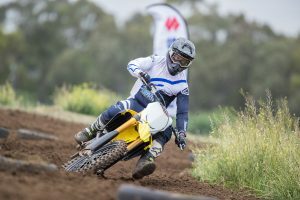 On the other hand, the shock has a somewhat softer feeling than I had anticipated and uses a lot of stroke, so the balance wasn’t immediately there for me during my initial laps at the launch. 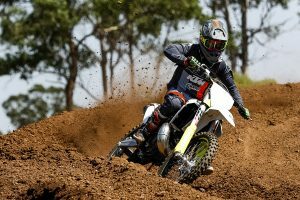 That’s not to say it was way out or handles badly as such, it was just different than previous RM-Z250s that I had experienced. 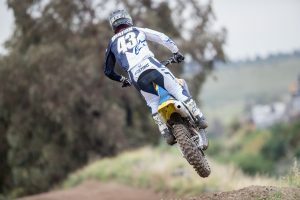 After adjusting the clickers and also setting the sag, the balance did become more accurate to suit my weight, track conditions and speed, so that made it more stable and also increased the agility of the ride pretty quickly. 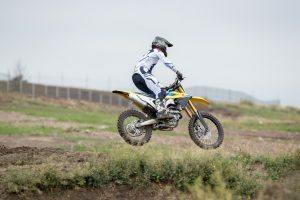 Ergonomically it’s comfortable, the revised triangle and handlebar positioning is quite neutral, so aside from some minor adjustments it was good for me in production trim and should offer a versatile platform for riders to work with. With a personalised suspension setting it would be paired well with the updated frame, which – again – will make for a more competitive option in terms of racing at a variety of levels. Change is always welcomed, which for Suzuki in 2019, makes for an entirely new motocross package. After a single day on the bike during Suzuki’s press intro, it’s clear that the 2019 Suzuki RM-Z250 marks a step in the right direction in the engine department, especially for the more aggressive riders who are able to make full use of its over-rev capabilities. 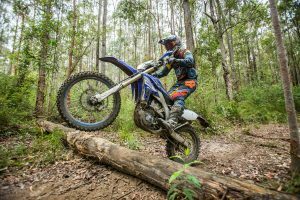 It’s still a good option for lesser-experienced riders, but if anything it offers a broader platform in terms of outright performance. With smartphone tuning due to be added (likely standard) prior to its release date early next year, that could be the key to placing the power right where you’d prefer it to be, whether it’s lower or still toward the higher-end in the RPM range. Same goes with the chassis, you will make gains on the race track with the MY19 and some personalised development will offer a strong step forward if you’re competing aboard the latest generation RM-Z. 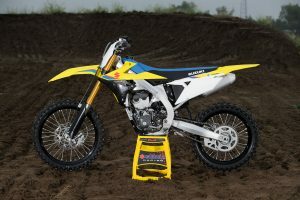 Visually, this new-look modern appearance is on point and is vastly similar to the 450 that came out for this year. Expected to arrive locally in February 2019, which is somewhat later than many of its rivals, Suzuki has indicated the price will come in at $10,490, which is around a thousand dollars less than the more expensive options in the category. 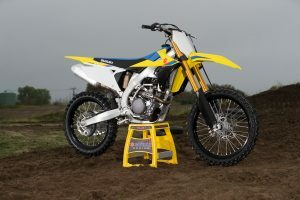 With that, this is a ride worth taking a serious look at if you’re in the market for one of the latest 250Fs.